1.Has Turkey’s government taken an official position regarding the situation in Venezuela? If yes, what is the position? Turkey presents the peculiar case of a right-wing government with historically close geopolitical ties to the USA supporting President Maduro both verbally and commercially. 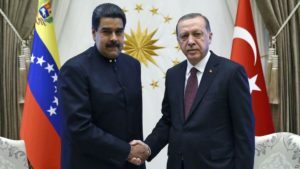 Over the last year, Recep Tayyip Erdoğan has developed an ever friendlier rapport with Maduro, visiting him in Caracas and receiving him in Ankara. Over the course of these visits the Turkish and Venezuelan governments concluded a deal by which Venezuela exports unrefined gold to Turkey in return for crucial foodstuffs, an agreement especially significant given the relatively weak trade relationship between the two countries previously. Venezuela had had difficulty profiting from its gold supply, having not developed the industrial capacity to refine it, as Turkish companies will now do. Turkey has accepted the unrefined gold as currency, which is good because the Venezuelan Bolivar is now effectively worthless. 2. What does this (fail to) reveal about the foreign policy/international standing of your country? By loudly defending Maduro, Erdoğan claims anti-imperialist leadership at a time when people are still angry about the 2016 coup attempt and think that the USA is conspiring with the Kurdish YPG against Turkey. He and his allies want us to put Venezuela, where the USA has indeed been recurrently involved with various anti-Chavista coup plotters from 2002 to the present, in the place of Turkey and vice versa. The question of whether the Venezuelan working class still benefits from Chavismo as it did in the 2000’s is not a question they wish to foreground, any more than that of whether the Turkish working class benefits from Erdoğan. The point is rather to cultivate a beleaguered nationalism. 3. 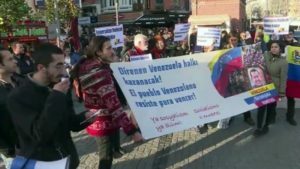 Have left groups/parties/movements come forward with a position on Venezuela? If yes, what has their position been? What does this (fail) to reveal? It should be no surprise that the Turkish Left presents a generally pro-Maduro position. So on the surface at least, there is now an issue on which Erdoğan and the Left agree! Of course left-wing media tends to doubt that Erdoğan’s new-found anti-imperialism is sincere or genuine. Some commentators distinguish what they call his opportunism—taking advantage of a crisis to get his hands on some gold—from their own principled support for a socialist government fighting US imperialism. In that sense, the debate somewhat resembles debate in Turkey over Palestine: both Right and Left claim to be its true champions. Leftists may want to ignore or explain away the right’s fondness for claiming the mantle of anti-imperialism, but it would be a mistake not to examine more closely how, at least with his own voters, Erdoğan is able to get away with it. In my own anecdotal experience at least, AKP supporters do not see their party the way we on the left tend to see it, as a historically neoliberal and pro-American party; rather, they see it as standing up for Muslim Turkey against the arrogant West. This side of the party’s appeal has become more pronounced since the coup attempt of 2016, after which the rhetorical cards of partisan politics have been reshuffled. With everyone wrapped up in the idea that the USA was behind the coup attempt, the AKP has presented itself more forcefully as an anti-imperialist and nationalist party, and even toyed with Kemalist imagery in order to woo that segment of the population that reveres Atatürk as the man who sent the western powers packing after the First World War. The Left should be able to offer something more, and at times it has; Hayri Kozanoğlu’s recent article in BirGün, for instance, discusses the Venezuelan crisis in a nuanced and essentially class-based fashion. The officially center-left main opposition party, the Republican People’s Party (CHP) has put out a statement criticizing both US intervention and the Maduro administration; yet the former appears only in a brief reference to Trump and the latter only in terms of “authoritarianism” and “corruption”–terms transferrable to the Turkish leadership, and without any explicit class perspective. Turkey’s Referendum: the Poverty of An ..
Quilting Point: why leftists should defe .. Empathy or Solidarity: A Word of Advice ..
Borat and the Zen Master: the War on Ter .. Since Chavez’s rise to power we have warned in many articles discussing the condition of Venezuela that what has been called the “Bolivarian revolution” is in truth not a revolution but rather a bourgeois reform program and in fact a hindrance to the workers’ revolution. The Bolivarian government claiming to have developed socialism fort he twentieth century has touched neither the monopolistic bourgeoisie nor the foundations of the bourgeois state. Because by expropriating the monopolistic bourgeoisie the government would of necessity have sharpened class struggle to the point that it would have come face to face with its own collapse and with that of the bourgeois order of which it was a part. Today the working classes of Venezuela, Brazil and other Latin American countries unfortunately face the consequences of having put their faith in reformist leaders without any revolutionary prospects—and these consequences are very bitter indeed. They include fascism, as we see in Brazil, and the threat of a coup and civil war, as in Venezuela. The only force that can face down these threats is the working class, so long as it rises to its feet on the basis of its own independent class interests (my translation). Notwithstanding these relatively rare exceptions, the pressures of binary thinking have for the most part held the day on the socialist Left, no doubt in part because of the real threat of a US military intervention. With opposition to neoliberal globalization and imperialism coming from many corners, not only leftist ones, it is a good time for the Left in the Global South—and perhaps especially in the Middle East—to critically examine the persistence of a version of anti-imperialism left over from the era of Soviet geopolitics and the anti-colonial rebellions it supported. That is, an anti-imperialism with an underdeveloped sense of class politics, in which any kind of regime can qualify as progressive so long as it opposes or seems to oppose US imperialism. Right-wing governments like those of Turkey or, for that matter, Syria or Iran, can plausibly line up with Chavez or Maduro where this struggle between the West and the rest appears as the underlying fault line. The alternative is not to support a US invasion or the opportunistic Venezuelan rightists who invite one, but to bring to the public’s attention the interests of the working class as such, so that its sympathies are not always coopted by conservatives who can name the enemy (e.g. US imperialism—or even, on occasion, “capitalism”!) without having the means or even the desire to fight it.